Has a wide range of applications. Especially where no high mechanical strength is required and where the use of compounds is not allowed.Because of its purity, inertness, high temperature resistance and electrical isolating properties, PTFE finds most of its applications in chemical-, food-, pharmaceutical- and electro-industry. Same as VIRGIN PTFE but improved creep resistance. Excellent weldability, reduced porosity. Used for valve seats, lining sheets etc. TFM® is a brandname of Dyneon/3M. PCTFE (Polychlorotrifluoroethylene) is chemically related to PTFE (Polytetrafluoroethylene). PCTFE’s most striking property is its capability to operate and maintain its elasticity at extreme low temperatures (-273°C). PEEK (Polyether ether ketone) is a semi-crystalline thermoplastic with excellent mechanical and chemical resistance properties that are retained to high temperatures. PEEK has a glass transition temperature at around 143°C and melts around 343°C. It is highly resistant to thermal degradation as well as attack by both organic and aqueous environments. It dissolves completely in concentrated sulfuric acid at room temperature. ngs, piston parts, pumps, HPLC columns, compressor plate valves, and cable insulation. It is one of the few plastics compatible with ultra-high vacuum applications. PEEK is considered an advanced biomaterial used in medical implants. It is extensively used in the aerospace, automotive and chemical process industries. 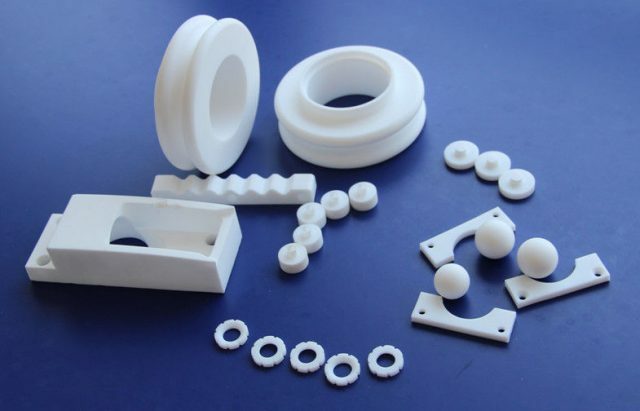 POM (Polyoxymethylene, also known as acetal, polyacetal and polyformaldehyde) is an engineering thermoplastic used in precision parts that require high stiffness, low friction and excellent dimensional stability. POM is characterized by its high strength, hardness and rigidity to ~40°C, with a melting point of 175°C. PA (Polyamide or Nylon), solid nylon is used for mechanical parts such as machine screws, gears and other low- to medium-stress components previously cast in metal. Engineering-grade nylon is processed by extrusion, casting, and injection molding. Polyamide can be used as the matrix material in composite materials, with reinforcing fibers like glass or carbon fiber; such a composite has a higher density than pure nylon. Such thermoplastic composites (25% glass fiber) are frequently used in car components next to the engine, such as intake manifolds, where the good heat resistance of such materials makes them feasible competitors to metals. Perfluoroalkoxy or PFA is a type of fluoropolymer with properties similar to PTFE. It differs from the PTFE resins in that it is melt-processable using conventional injection molding and screw extrusion techniques. PFA was invented by DuPont and is sold under the brandname Teflon PFA. Teflon is better known as the trade name for PTFE. Other brandnames for granules are Neoflon PFA from Daikin or Hyflon PFA from Solvay Solexis. PFA is very similar in composition to the fluoropolymers PTFE and FEP (fluorinated ethylene-propylene). PFA and FEP both share PTFE’s useful properties of low coefficient of friction and non-reactivity, but are more easily formable. PFA is softer than PTFE and melts at 305 °C. PVDF (polyvinylidene difluoride) is a highly non-reactive and pure thermoplastic fluoropolymer produced by the polymerization of vinylidene difluoride. PVDF is a specialty plastic material in the fluoropolymer family; it is generally used in applications requiring the highest purity, strength, and resistance to solvents, acids, bases and heat and low smoke generation during a fire event. Compared to other fluoropolymers, it has an easier melt process because of its relatively low melting point of around 177°C. It is available as piping products, sheet, tubing, films, rods and wire. It can be injected, molded or welded and is commonly used in the chemical, semiconductor, medical and defense industries, as well as in lithium ion batteries. Used increasingly in aviation and aerospace applications.